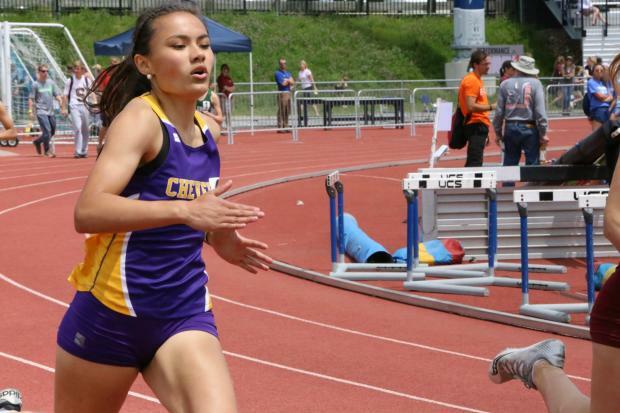 Cheverus freshman Victoria Bossong lowered her less than week old 400m state record with her 6th place effort of 56.24. The time lowered her own state record by .03 which she set last weekend at the New England's. The Bonny Eagle girls just missed their own state leader in the 4x800 as they clocked 9:35.35 to place 16th out of 25 teams in the Emerging Elite race. They placed 7th in section 1. Kayla Raymond led the way for the Scots with a 2:17.88 split. Moxie Flanagan of Hampden Academy finished 12th in the 3000m racewalk with a time of 16:11.52. Gorham's Stefanie Meachem clocked 17:22.12 to finish 20th.